HomeNewsPress ReleasesGot to Run With It! Got to Run With It! Note: High resolution jpegs (300 dpi) of last year’s race and a Florida manatee, are available upon request. Michigan participants in the 2017 Manatee 5K Race. 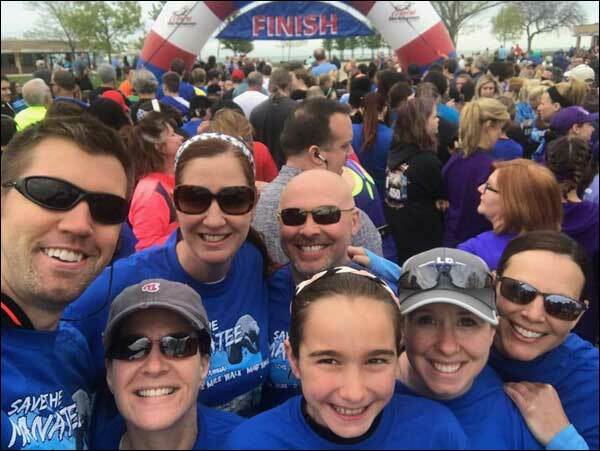 Come to scenic Lake St. Clair Metropark in Harrison Township, Michigan on May 19th for the 15th annual Save the Manatee 5K! Participants in the race will be contributing to the ongoing conservation and education efforts of Save the Manatee Club, a nonprofit conservation organization based in Florida and established in 1981 by singer/songwriter Jimmy Buffett and former Florida Governor and U.S. Senator Bob Graham. Race directors Lesley Argiri and her husband Brian McDonald, teachers at L’Anse Creuse public schools in Harrison Township, Michigan, created the 5K, 2-Mile Walk, and Mini-Manatee-Mile, so that people of all ages have the option to run it, walk it, casually jog it, or just be there for the fun of it. The 5K attracts over 1,200 people each year in the physical race with hundreds more taking part in the Virtual Run, which drew interest last year from all 50 U.S. states and 13 foreign countries. Now everyone, not just Michiganders, can join the race by doing a Virtual 5K on a date, time, and place that’s convenient. Choose the activity, too. Run, swim, kayak, cycle, stroll along, or rollerblade on a favorite course or trail, all in support of manatees. Participants in the May 19th race in Michigan or in the Virtual 5K receive a race packet with a unique t-shirt and manatee race bib as well as a newly-designed finisher medal featuring two manatees. All runners and walkers at the Michigan 5K are scored (chip timed) using the Chrono Track B-Tag. There are age group awards for the 5K run only with finishing medals for all events. Door prizes will be drawn from the bib numbers. This is a dog-friendly event for anyone wishing to bring along the family pooch. Note there is a $10 park entrance fee that is not included in the race entries. After the race, photos are available for all participants. Also, Save the Manatee Club’s Manatee Research and Multimedia Specialist, Cora Berchem, will have an education booth set up where participants can gather information on manatees and Adopt-A-Manatee right on the spot. Sign up family members and join friends for the Save the Manatee 5K or Virtual Run! To get more information and to register, go to savethemanatee5k.com. Questions? Email Lesley Argiri at largiri1@hotmail.com. Join the Club on Facebook to get updates on the states and countries that have the most participants. Learn more about manatees and Save the Manatee Club’s conservation work.